Beef Brisket Burnt Ends Hash with White Cheddar Fondue and Pickled Jalapenos. If the name alone doesn’t start your mouth to watering, I’d get to a doctor and make sure your pulse is still kicking. As for me, this was an item I was very excited to see returning to The Smokehouse for the 2017 Epcot International Flower & Garden Festival. I’ll be honest with you, last year’s menu had me at ‘burnt ends,’ once I was able to try the dish, it didn’t disappoint, and I was hopeful it would return this year. While I joked above that this dish should bring joy to everyone, I know full well that it won’t. For starters, I have many friends who are vegetarians or vegans, and this clearly is not something in their wheelhouse, and I respect that. Also, beef brisket can be an acquired taste. I happen to live in one of the barbecue cornerstones of the country, so I have had ample chances to develop a taste for beef brisket barbecue. Some people may only think of pulled pork when they consider barbecue, and while that is delicious and has its place, which is not brisket. There is more connectivity between the meat with beef brisket, as well as a bit more fat to contend with. Beef brisket is typically served in slices, the thickness of which varies wildly, but at The Smokehouse they’ve mixed it up by providing guests with cubes of brisket labeled as ‘burnt ends.’ Historically, these are the unwanted scraps of the barbecue process. The overly dry or fatty pieces that could be used in stews or served up as a cheap appetizer, but were seen as having very little else that was appetizing. Except that the ends still carried with them the rich flavors and smokiness from the barbecue process. This burnt ends became highly sought after and soon pitmasters became known for how well their burnt ends taste. The Burnt Ends Hash isn’t precisely what I would call ‘burnt ends’ in the traditional sense, but they still retain the delicious bark and crunch along the outer edge. The cubed form is more akin to what you would find it a typical hash, tossed in with an assortment of other vegetables, peppers, onions, and the like. Liquid gold is a term usually withheld for a yellow cheddar sauce, but since there is such a thing as white gold, I think we can let it apply to the white cheddar fondue that coats the hash here. Then it is topped with a handful of pickled jalapenos. The jalapenos aren’t your typical from-the-jar jalapenos, and their acidity does wonders for the richness of the beef and cheddar. Barbecue enthusiasts from those cornerstone areas we talked about earlier, are probably not going to find this brisket to be inspired. However, to the average palate, it is probably a reasonable facsimile, especially if they’re not accustomed to either burnt end or beef brisket. As with most items procured through a quick service avenue in Walt Disney World, consider the amount of food which needs to be prepared and the speed in which you are able to procure it. Is this a top-tier barbecue product? No. Is it a savory treat that I wish my local pitmasters would figure out how to recreate this in a more traditional form? Absolutely. 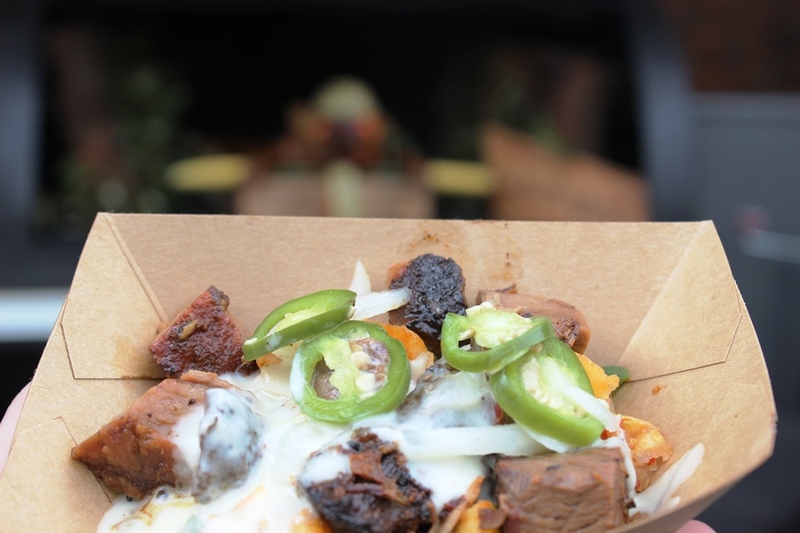 Do I think you should make time to try the Beef Brisket Burnt Ends Hash while you’re visiting the Flower & Garden Festival? Without question. I've been getting excited for my next trip - Flower and Garden 2018. The only other time I've been was in 2015 - I loved the outdoor kitchens. This burnt ends sounds like a winner - I've saved the link to my folder for next year.